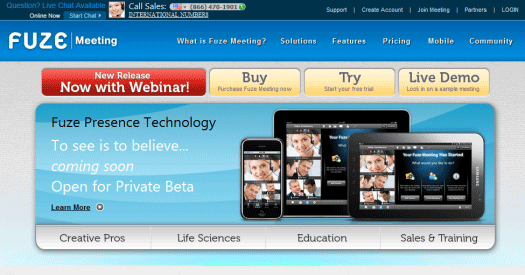 Many of us are aware of GoToMeeting. We’ve heard the radio pitches, seen the TV commercials, and might have even checked out their website once or twice. But if you’ve had some reservations about your web conferencing software, you can join the club: there are a lot of people out there not sure if all the hype is matched by the actual quality of the GoToMeeting product. Of course, this wouldn’t be an issue if GoToMeeting held a monopoly over the world of web conferencing. Lucky for us, it doesn’t. There are plenty of alternatives out there – many of them with features so enticing that they will certainly merit your consideration as your meet-up machine of choice. Which are they? Well, you don’t think we’d set you up like that just to avoid telling you, do you? Another popular piece of meeting software at virtually the same exact price as GoToMeeting, WebEx should definitely make your short list of products to buy. It’s a solid candidate because of its range of features – top notch and comprehensive – as well as a nice two-week free trial that lets you sample the goods before taking the plunge. 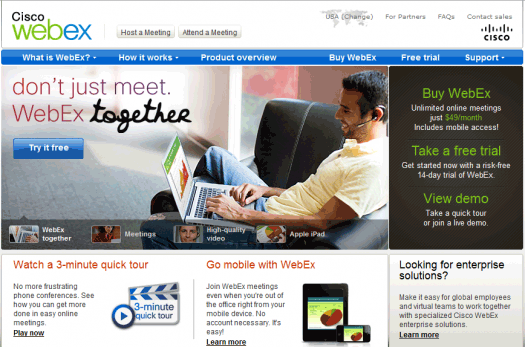 You can’t really go wrong by checking out WebEx. But is it really better than GoToMeeting? Well, it’s a good question. Essentially, it’s the same exact thing. The features are close, it’s popular, and the prices don’t vary wildly. We recommend you give WebEx a the old college try with its free trial and see if there’s one feature or two that convinces you it’s the online meeting software you’ve been looking for. If there was an “editor’s choice” tag I could apply here, I definitely would: Fuze Meeting is a great overall combination of price, quality, and usability that should make the same short list of candidates that you scribbled WebEx on. Don’t believe me? Try the thirty-day free trial and get back to me. Or check out the pricing, which is twenty dollars less per month than the “leading” competitors like – you guessed it – GoToMeeting. A GoToMeeting alternative that costs less? Where can I sign up? To be fair, if I had two editor’s choice tags to give out, the second would go here, because Mikogo deserves to be highlighted. Why? It’s the freest option for web conferencing I’ve come across. If that’s not reason enough for you to check Mikogo out, you may also want to check your pulse. Though the name might sound, shall we say, StupidStupid, DimDim (now owned by SalesForce) makes up for it with such quality offerings that you can’t help but wonder – gosh, why did I ever consider GoToMeeting in the first place? That’s a bit harsh to a quality piece of software, but it’s meant as a compliment to DimDim’s overall usability and generous pricing features – yes, you have to pay more than you would with Mikogo, but you also get a lot of bang for your buck. Some people have small businesses that are ironically big enough to justify that kind of investment, and given DimDim’s generosity with the pricing, it’s actually not much of an investment at all. In this article, you may find yourself presented with a paradox of choice: now that you have four alternatives to GoToMeeting, it might be hard to choose any particular one. Our advice? Give the free trials on the more expensive programs a shot and if you’re not pleased, use a free service like Mikogo. There’s another great alternative out there – it’s called SalesCrunch, and it is completely web based. There is no download needed, and you can basically be up and running instantly. I don’t believe Mikogo has a free option anymore. But MeetingBurner does. You can hold meetings for up to 10 people free, without ads. Or upgrade for meetings up to 1000. There’s no download for attendees, and it’s a fast, full-featured platform. Fuze doesn’t have the $29 pricing anymore. They have the same price as Go To Meeting for the 25 people and the have a $ 15 pricing plan for 15 people. Would be interested in knowing if you still give them five stars. uuuh, The DimDim link doesn’t go to DimDim, but then they were taken over by Salesforce.com in 2011??? @Pepita thanks for pointing that out. I just took down the DimDim review because of the Salesforce buyout. Too bad, I liked the name. Removed the link. Dan, if you’re out there, would love to hear your opinion on Fuze. My personal favorite is join.me It’s free, easy to use, and I do not think they have limits on the number of people in the meeting. They also have a paid version that adds additional features but if you are looking for something on the fly this is the product to use. We haven’t reviewed join.me yet but I’ve used it with in client calls a lot and I think it’s a great alternative as well. We recently launched “vLine link”: vline.com. It’s a simple, free multi-party video service that generates a link that you can use to host a meeting. It’s based on WebRTC, so there are no downloads or plugins required. Hey, you forgot to mention another alternative: RHUB web conferencing appliances. It is easy to use and works on both MAC & Windows computers. You can even try out on premise RHUB web conferencing appliances. It uses floating licenses and hence has no limitation on the number of users joining the meeting.